In Ear Matters: Sennheiser IE800. Yes, IE800, not IE80. Apparently news is really slow these days as I haven't seen much discussion on the IE800 announced just a few days ago in Berlin's IFA show. Well, apart of having a ceramic housing and two stainless steel vents on the back, Sennheiser also claims to have employed the world smallest ultra wide-band dynamic driver - 7mm in diameter with an impressive frequency response of 5Hz to 46.5kHz. Of course, Sennheiser never quite mentions that human hearing only extends up to around 20kHz (adult is more typically at around 16~18kHz) while most commercial source only play music up to 20kHz because that is where we stop recording in music. Don't get me wrong - having ultra wide-band playback is still a good thing because it might have better linearity / less distortion. But it is no guarantee for good sound quality. 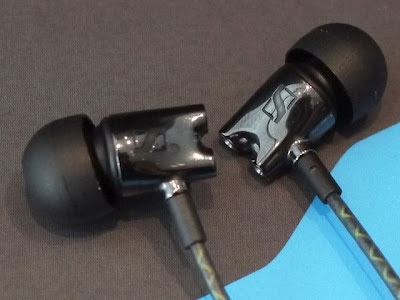 So don't buy headphone that claimed to have a longer extended frequency range and hoping it will be better. The truth is more complex than that. Anyway, prepare to pay big money for this as the early price quote is around 600Euro, or US$780 (*some claim a lower 500Euro), with an expected release date of 'summer 2012'. I don't know how well Sennheiser is expecting to sell this - $780 can get you a really good set of custom IEM, and a few hundreds more can get you flagship from some of the best custom maker in the market. Then again, Sennheiser pricing strategy has never made much sense to me in the past, and that probably won't gonna change any time soon. If you ever wonder why I don't usually review Sennheiser's IEM, that's one of the big reason right there.